Raoul Wallenberg is being honored with a stamp on the 100th anniversary of his birth. The stamp will be available for purchase on May 10, 2012. Swedish stamps help us create a picture of Sweden. They can feature our history, events or people who have made a positive contribution to the development of Sweden and the world. It goes without saying that Raoul Wallenberg is one of these people, says Britt-Inger Hahne, Head of Sweden Post Stamps. 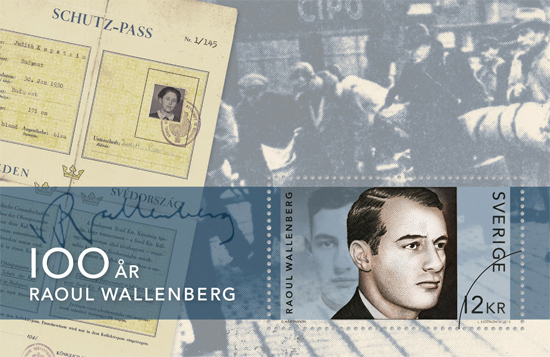 The stamp includes two portrait photographs of Raoul Wallenberg from different periods of his life. The stamp is part of a minisheet that also includes a view of Budapest, one of the protective passports issued at the end of the war by the Swedish Legation in the Hungarian capital and Raoul Wallenbergs signature. The designer is Gustav Mårtensson, the engraver is Lars Sjööblom and the stamp is printed in a combination of recess and offset at Sweden Posts stamp printing works in Kista. The denomination is SEK 12, International letters and greetings. It will be available for purchase on May 10, 2012. This is the second time that Sweden Post has issued a stamp depicting Raoul Wallenberg. In 1987, he was celebrated together with Dag Hammarskjöld and Folke Bernadotte in the In the Service of Humanity issue. Swedens Government has appointed a National Committee for the Raoul Wallenberg Year 2012. The Committee Chairman is Minister for Foreign Affairs, Carl Bildt, and the project is led by Olle Wästberg, the previous Director General of the Swedish Institute.